Suiyoubi no Campanella, who now use the English moniker “Wednesday Campanella” consists of three members: Kenmochi Hidefumi (music producer), Dir.F (director), and KOM_I (vocals and performance). Like those duties imply, only KOM_I is the only member who appears onstage during performances. Suiyoubi no Campanella’s origins date back to 2012 production meetings between Kenmochi and Dir.F who subsequently recruited KOM_I (Komuai). 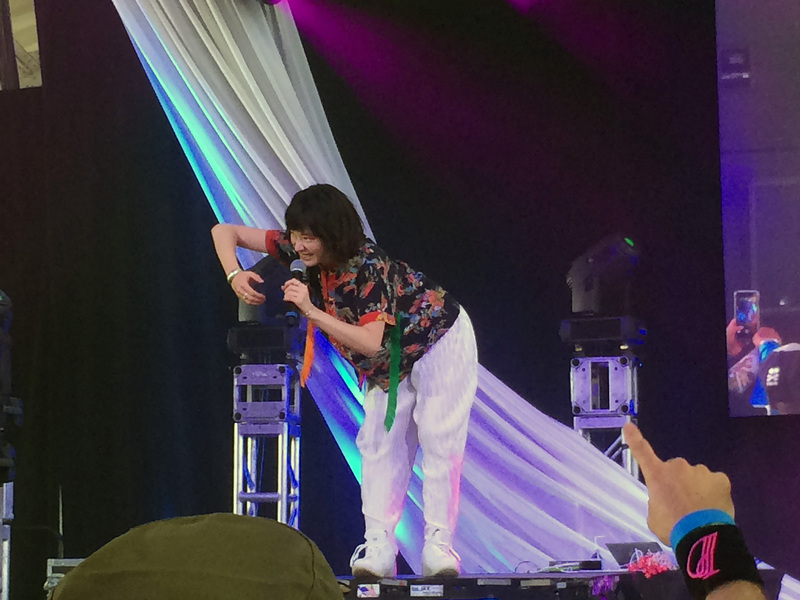 The July 23rd Suiyoubi no Campanella performance was not the group’s first American performance: KOM_I performed as Wednesday Campanella at the SXSW 2016 on March 15. 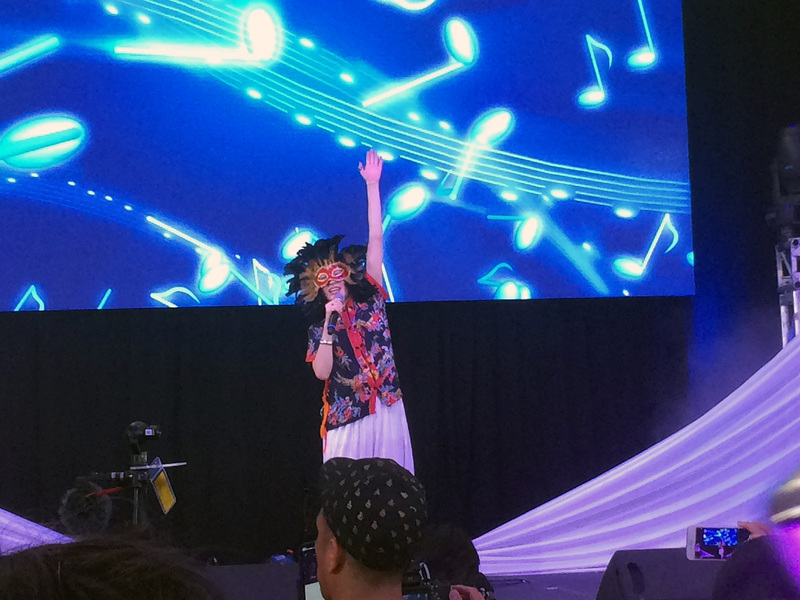 But, KOM_I created a festive atmosphere with her joyful and expressive performance. 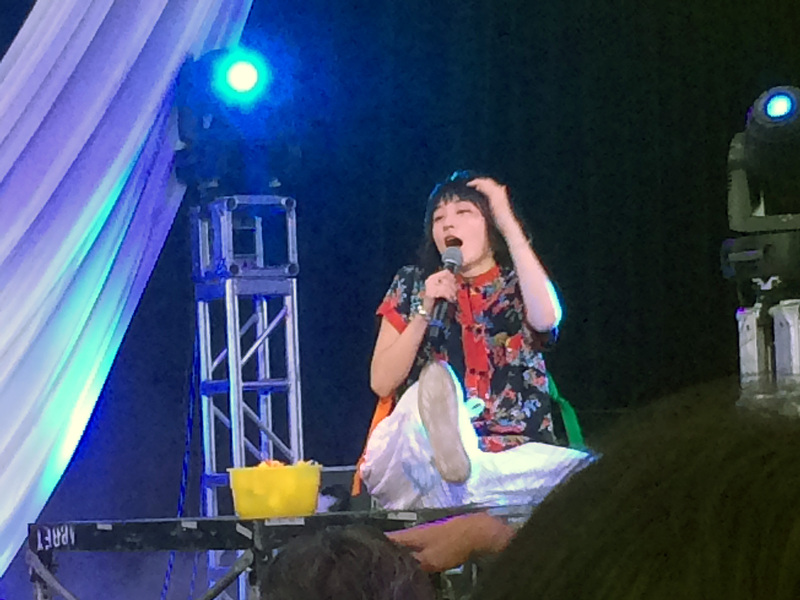 J-Pop summit definitely felt special for that half-hour spent with her mesmerized audience. 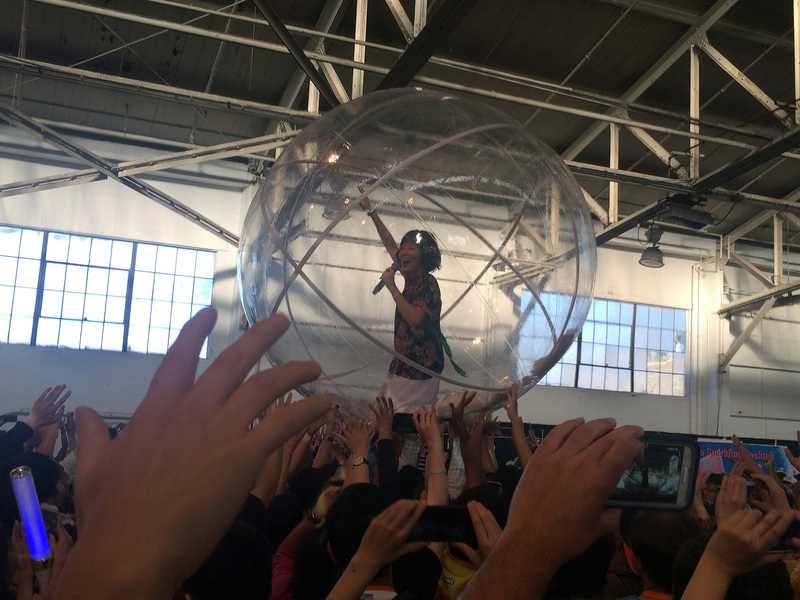 Suiyoubi no Campanella began her performance at Fort Mason in an unorthodox way. 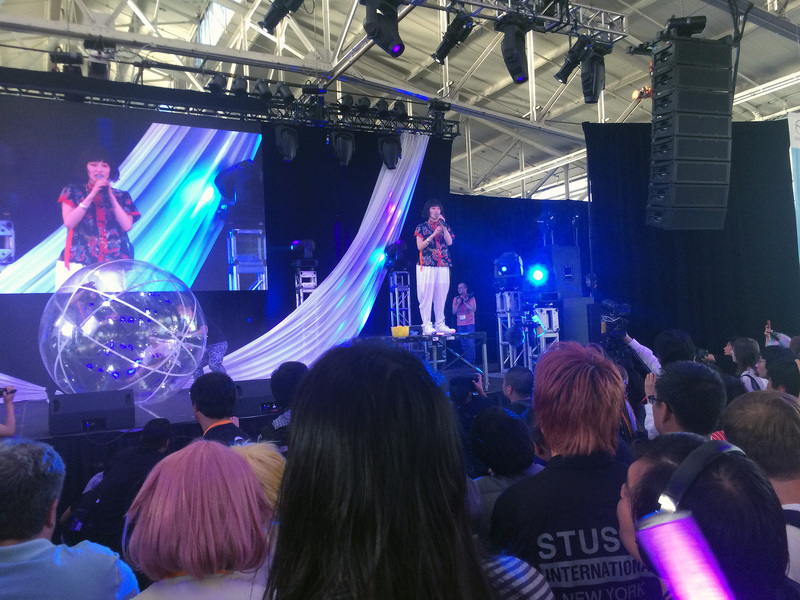 As the gathered J-Pop summit goers watched the stage, the music began. Then the singing began with no sight of KOM_I. Soon, the audience realized that KOM_I was somewhere among the audience. 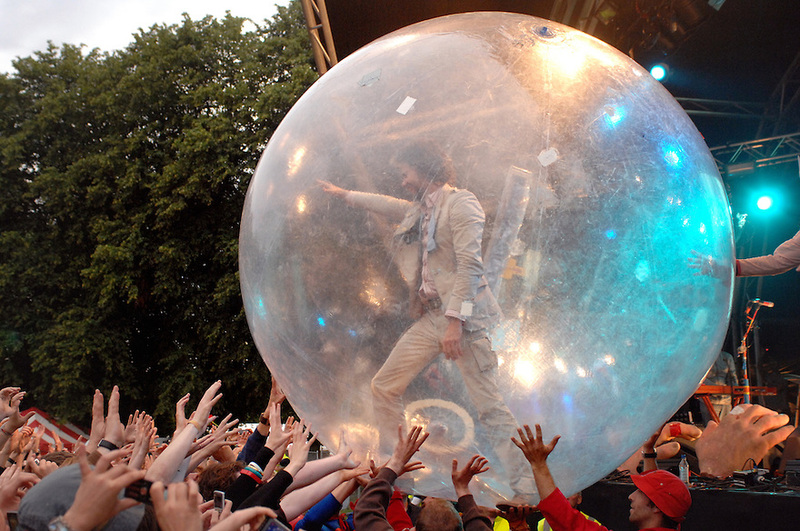 She eventually showed herself mounted on the large transparent statue of Domo directly behind the audience. Wearing a Chinese style top and loose fitting white pants, the artist increased intrigue by obscuring her face behind a maned black mask. I could feel the audience torn as they needed to decide whether to watch the monitor onstage or watch the living thing directly behind them. To make her way to stage, a palanquin hoisted KOM_I toward the front of the audience. 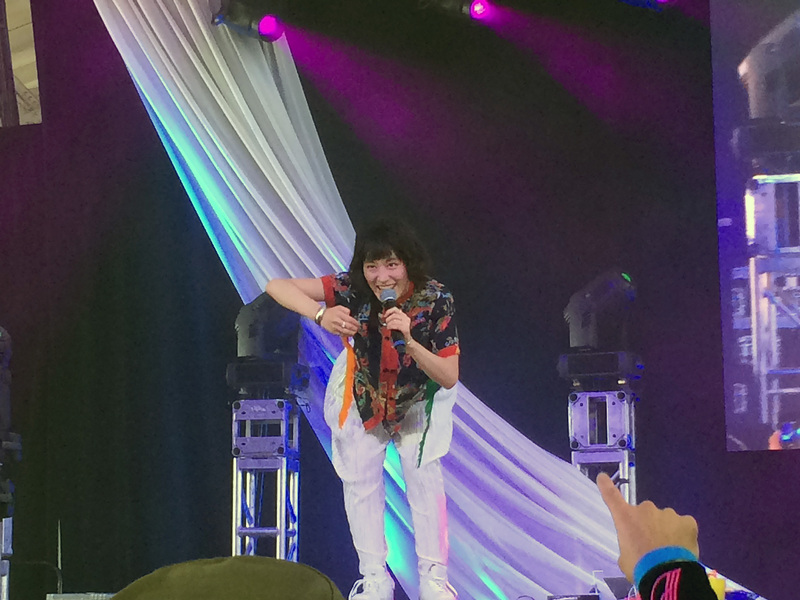 KOM_I’s onstage persona was wildly expressive. Although one would say she danced, the verbiage conjures visions of tightly performing idols in strictly choreographed routines. Rather than that, Suiyoubi no Campanella moved in contortions that expressed emotions rather than form. An equal partner in this evocative endeavor, KOM_I’s face was wildly demonstrative and revealed a wide range of emotions. The sum of her onstage performance was a feeling of jubilation that swept through the hall like an intoxication. 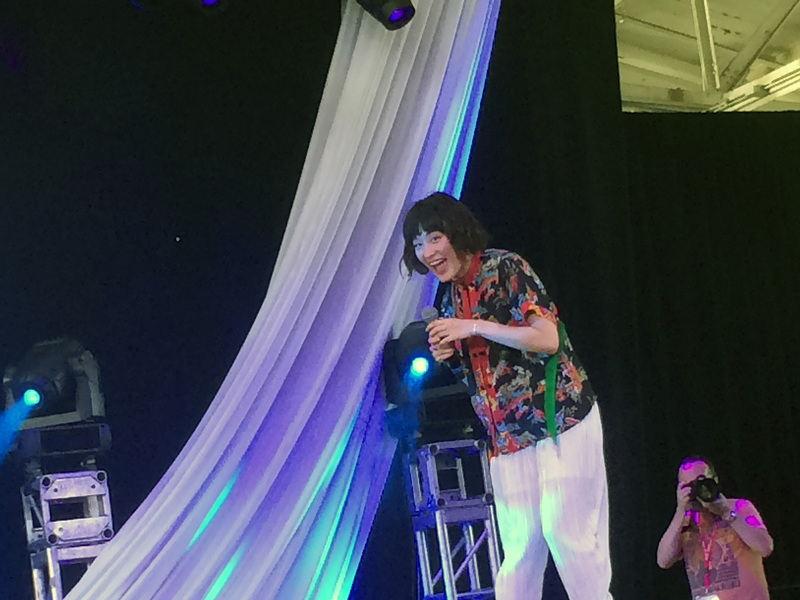 In the break between songs, KOM_I introduced herself as Wednesday Campanella to an applause which she didn’t seem to expect. But, her pure joy of music and performance struck such a chord with the J-Pop Summit audience; it was difficult not to be caught in KOM_I’s emotional typhoon. 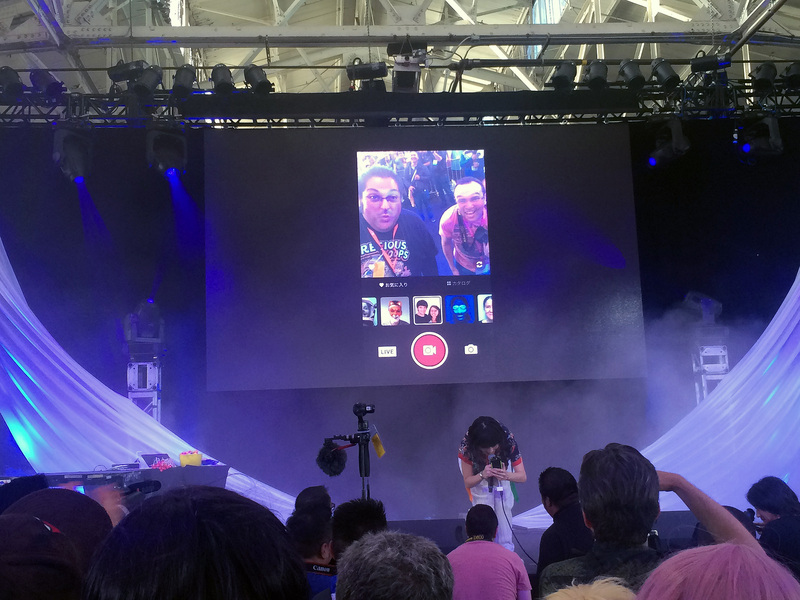 Visibly affected by the audience’s approval, KOM_I let slip that her birthday was the day before her performance, and she spent her yearly orbital anniversary in San Francisco. The author of this article may or may not have led the audience to sing “Happy Birthday” to a misty-eyed KOM_I. The music started up again, and KOM_I did not stay on stage very long. Soon, the performer made her way through the audience with protective security, cameramen, and press in tow. The crowd delighted in dancing with the artist in such an up close and personal way. Speaking as one of those audience members, KOM_I was only five-feet away from me at one point. The excitement level became palpable as she approached. 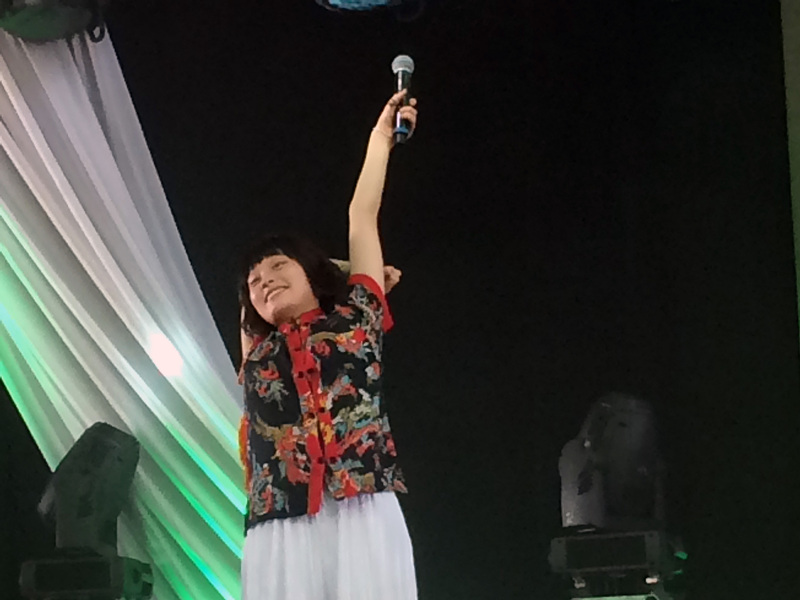 Back on stage, a tech member handed KOM_I a camera that was connected to the upstage audience monitor. As she sang, KOM_I held a microphone in one hand and her phone in the other while pulling face after face. 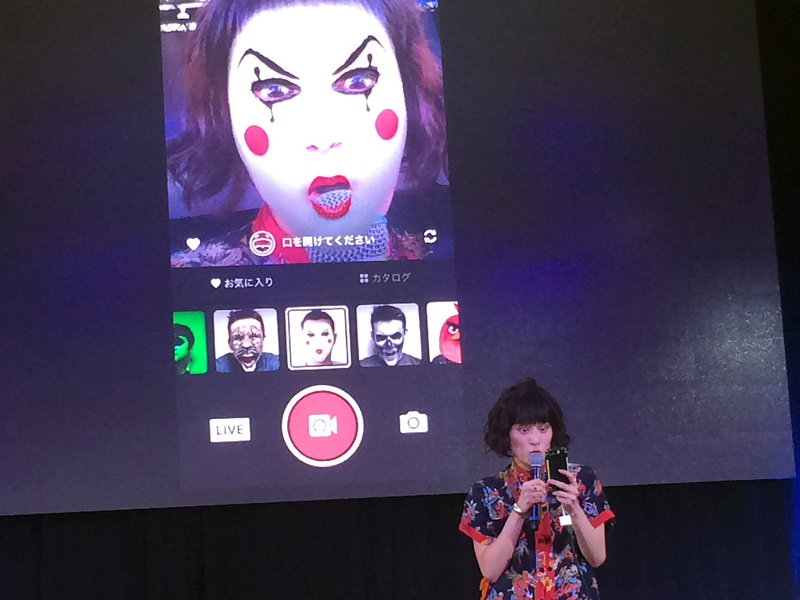 The audience video monitor showed the phone app filtering her face (Snapchat style) from a panda visage, to a clown popping red balls from its mouth, to a wrinkled obaasan. 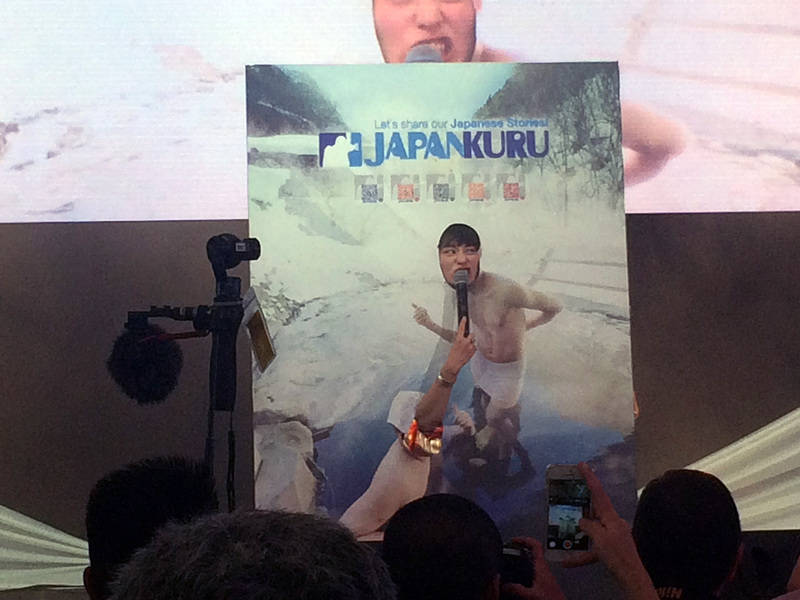 At one point, KOM_I pointed her phone at two members of the press corp and swapped their faces before commenting that their faces were too similar. For her final act, KOM_I stepped into an inflatable transparent balloon (you know the kind) which she used to walk and crawl over the audience. 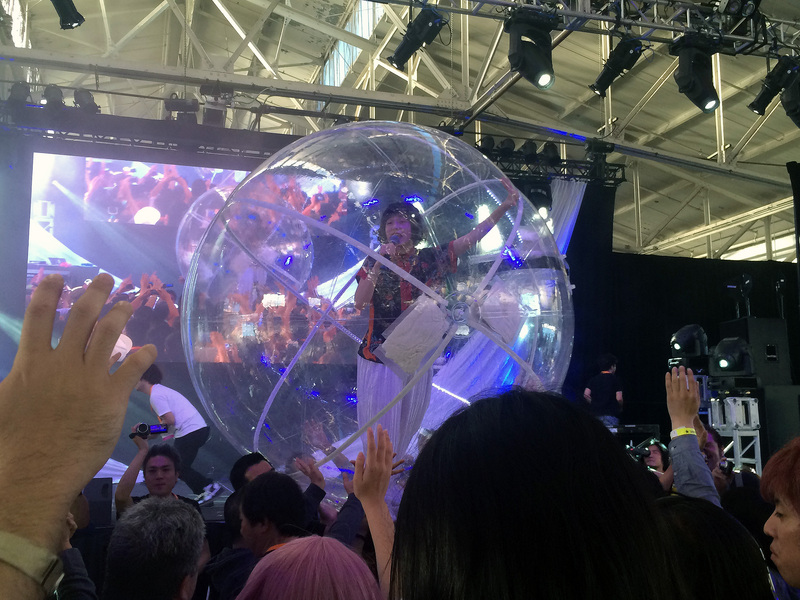 The visions of KOM_I moving over the audience like a hamster in a plastic ball might just be the most memorable moment of J-Pop Summit 2016. Of course, left to its own devices, the audience probably won’t carry one in her intended direction. 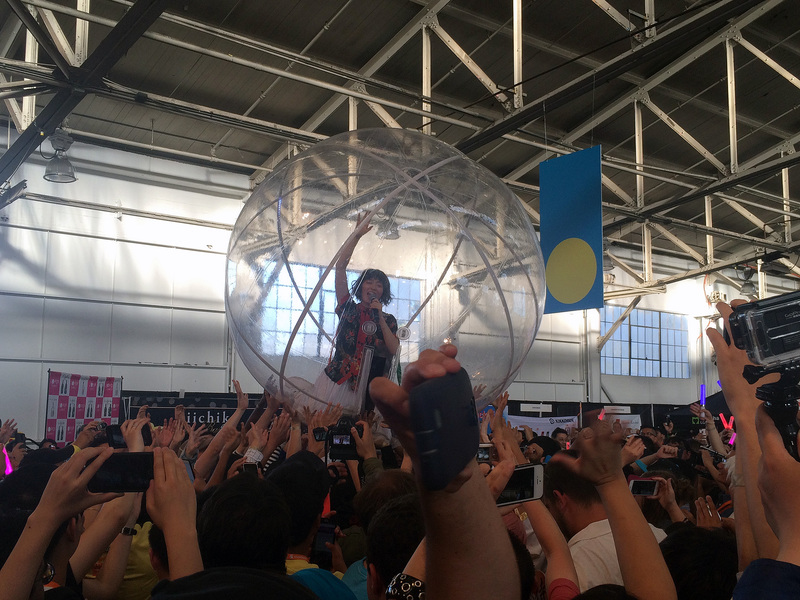 At times, KOM_I tumbled inside the ball in an attempt to indicate and influence her desired destination. The author of this article ended up directly under KOM_I in the ball twice, and each time it was a privilege to support her. 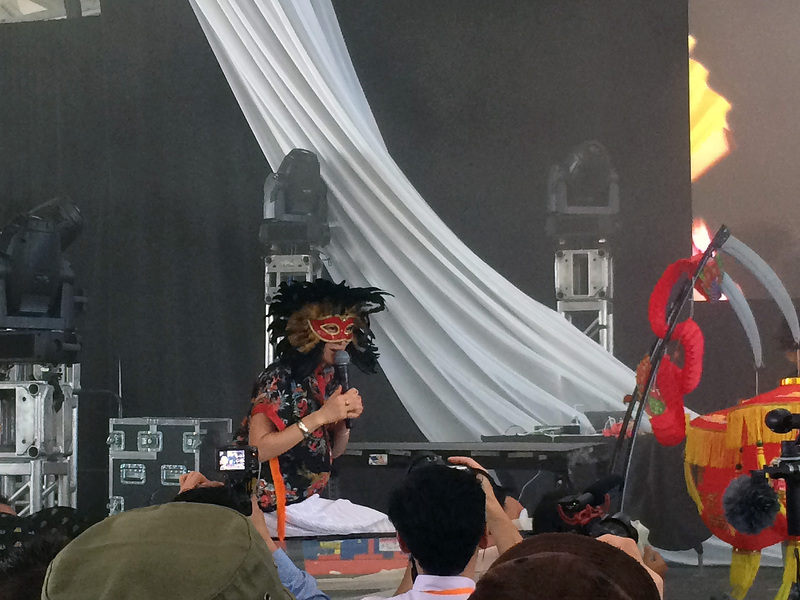 As all things come to its end, so did Suiyoubi no Campanella’s set. Directly after her performance, KOM_I was engaged for an autograph session at the rear of the Fort Mason building. 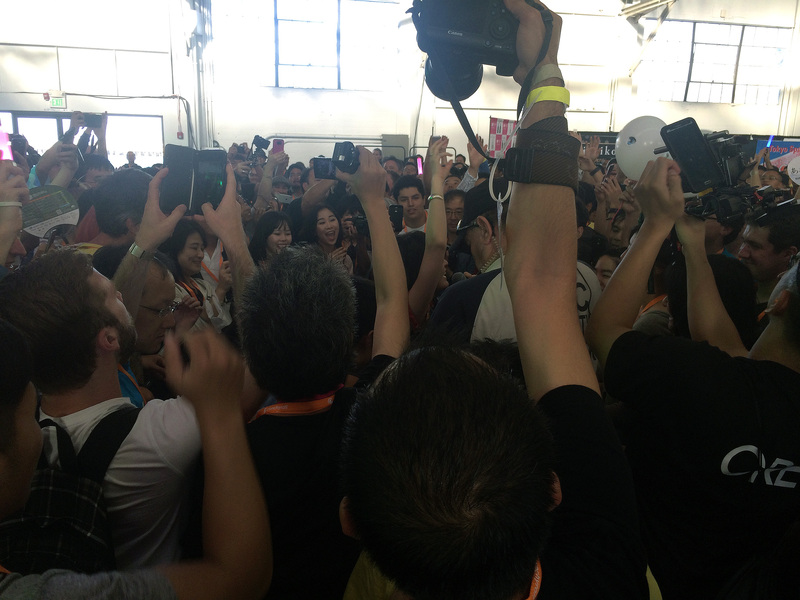 At the end of this final song, KOM_I directed us to carry her towards the booth for the appointment. 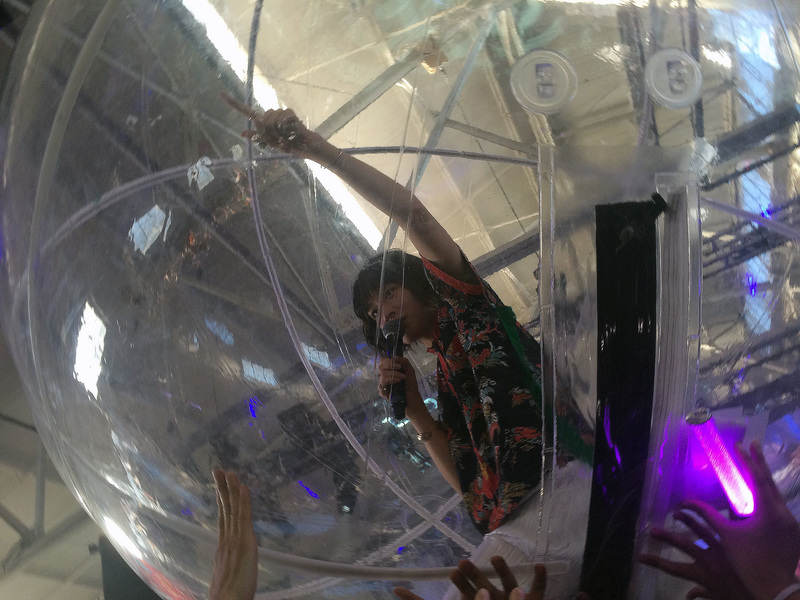 Suiyoubi no Campanella performance finished with the plastic capsule floating backwards away from the stage.